Message from your new editor. Most of you will be aware that Ian Stother has stood down as Editor and I have taken up the challenge to serve in that capacity. Ian will be a difficult act to follow and I would ask for your patience while I get to grips with the job. The Bulletin will continue as before and I would like to continue to include items of interest submitted from within our own membership. This month we have a contribution from David Gray with an account of a rally round Ayrshire in his magnificent ’25 Delage DISS that he has campaigned over Europe in the 50 plus years that he has been custodian. If you have something you would like to share with the membership I would be grateful if you would send it to me. Retiral of Liz Young as Club Secretary. Liz has retired as secretary after a lengthy stretch in this role. Liz performed her duties diligently and with enthusiasm and we are all grateful for her service. The Secretary’s job is presently vacant and we would welcome a volunteer for this post. Meanwhile, Ronnie Gordon will cover the post. B-B-Q 20th May at Maid of the Loch at Balloch. Everything is still provisional at this stage and the final arrangements will be published in future bulletins. Last minute changes, possibly due to adverse weather, will be published on the website so remember to check it before leaving early for a club meeting! Press release from Federation of British Historic Vehicle Clubs. We received a lengthy Press Release from FBHVC in December concerning “Substantial changes to historic vehicles”. With the formalities out of the way I have added a couple of items of general interest. I would like to include something of the nature in future bulletins and would be grateful for articles for this. I begin with David Gray’s erudite account of his run through Burn’s Country in his magnificent DISS Delage. Jock’s Run, An Ayrshire Ramble. As a change from basking in the sun in a traditional M6 traffic jam on my way to Portsmouth and “La Belle France”, I entered the DISS in “‘Jock’s Run, An Ayrshire Ramble”, a Royal Scottish Automobile Club event, in Burn’s country, as the only pre-war car in a field of classics, of which a scuttle shaking 1955 TR2 was the oldest. Grandson Sam, aged 13 (lucky for some), my navigator for the day, was able to broaden his education in the land of the Clydesdale, as the start HQ was at the Morris Equestrian Centre, near Fenwick, where, as the crews munched bacon baps and pre ordered the evening meal, they could watch, through a vast double glazed window forming the end of the dining room, a coal black pony, flanked by two pure white ones, being expertly wheeled by their trainer in the adjoining covered exercise court. Mindful of the strictures of the Duke of Wellington on frightening horses, we were reluctant to sound the Klaxon as, first off and armed with our ‘tulip’ pattern route book, for WHEN we got lost, we charged off, to maintain the honour of the marque, on the straight and traffic-light A751 in bright sunshine. For the first few miles the rear view mirror remained clear of classics. Then we turned off into Ayrshire “profond”, single-track roads reminiscent of Provence 40 years ago, but now, steadily vanishing there with EU grants. The 21″ wheels dealt with the potholes which snared and slowed the short wheel based classics, but the arrival of four cars aiming to share a single passing place, and that bordered by a bog, inspired flights of language from an oncoming “classic” Land Rover, towing a vast tanker full of slurry, language that Tam O’Shanter’s wife, “nursing her wrath to keep it warm”, would have been proud of, unintelligible but unmistakeable in import. Thereafter, we pulled aside to let the knot of scurrying classics pass, as Sam, as navigator, estimated the mileage on the tulip pattern route instructions without a mileometer, and threaded us through the maze of winding and crumbling narrow lanes towards the Clyde coast and lunch at West Kilbride. Chesterton patriotically celebrated “the rolling road, the reeling road the English drunkard made”. His Scottish compeer is equally up to the mark. On such “roads” long wheel based vintage cars can sometimes achieve falling into two ditches at once, and their twin pronged dumb irons are feared in the ancient Provencal sport of ‘petit chemin’ jousting, now in decline with road improvement schemes in the land of the troubadours, but honoured still in the land of The Auld Alliance. As, after lunch we climbed out of Dalry (the King’s Valley) making for West Kilbride and the Firth of Clyde, the tulip route system gave us a swithering choice of routes on the same mile mark, worthy of the hero of “Pilgrim’s Progress”. A nice easily seen turn, on to a well paved road led by slow degrees to a “Slough of Despond” where splashes of slurry decorated the coachwork of the unwary, as they fought to control a downhill skid. Well does the name of Kilbride (ceol=cell) remind us of St. Bride, patron saint of cattle! By contrast, a narrow, scarcely discernible opening, beside the stone wall of the town cemetery, where Victorian statuary marked the rituals of death, a crumbling track climbed circuitously ever upwards, to the sunny uplands of Fairlie Moor, where once the dyke-leaping* black faced sheep (each a potential Aintree entry) had been outfaced, the Firth of Clyde, with the peaks of Arran and the isles of the Cumbraes, lay out before us in the afternoon sun. As we studied the O.S. map, a scarcely seen lark spilled out its song across the headland. Not another car in sight! On the single track roulette descent to the coast road at Fairlie, rattling over cattle grids, the new soft brake linings performed reassuringly, the great grooved brake drums dissipating the heat well on the long descent. All too soon the prescribed route obliged the DISS to forsake its easy stride past the serried golf courses (Gailes, Barassie, Presidential Troon, Prestwick) and “tattie” fields of the Clyde littoral. Stopping only to demolish freshly made ‘Italian’ ice creams in Ardrossan, we plunged back into the countryside, where names such as Bogend and Drakemyr give an idea of the terrain, where never a European road repair grant had reached since Tam O’Shanter’s mare, Meg, had bestrode it. But our navigator stuck to his task and we rejoined the company where he was awarded Best Navigator prize, at the end of a superb dinner, reinforced by the welcoming hospitality of the Morris Equestrian Centre and The Royal Scottish Automobile Club. *dyke = not in the American usage, but meaning a stone wall, as promised to Mexico. Thanks to David Gray for this. Now, a little something from me. I enjoy reading little anecdotes involving motoring history and this is my account of a brave attempt to establish a quality car industry in southern Ireland in the early years of the last century. This is an account of a unique Edwardian motor car. I had been totally unaware of the existence of this fascinating vehicle until I spoke to a member of our local vintage motor bike club. I was discussing the prospect of a tour of southern Ireland in my Morris when he told me of a most interesting motor museum he had visited in Killarney many years ago. 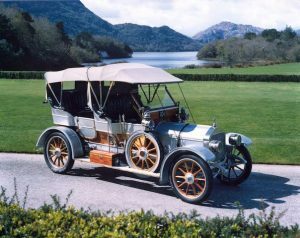 This was owned by Denis Lucey, a retired vet who had amassed a fine collection of early cars, mainly Wolseley, but also included a fine Edwardian car that had been built by an Irish engineer with the intention of starting a motor industry in Ireland. The car was built by Phillip Somerville-Large who was a civil engineer and had a distinguished career in railway engineering in India and the Far East. On his retirement to his native Ireland he had too much energy to enjoy a well earned rest and decided to embark on a business building motor cars. These would not be mass market machines but fine precision built cars to rival Rolls Royce and Napiers. The first car was to be assembled from components purchased from a wide range of suppliers which was the method first adopted by William Morris. This would be no back yard lash-up but a well designed machine whose component parts had been carefully selected to create as fine a car as current technology would permit. I should mention that not only has the car itself survived but blueprints, detailed notes and calculations made by Mr. S-L have been preserved giving a fascinating insight into its creation. These show his fine attention to detail and, in this respect, he must have been similar to Henry Royce. Mr. S-L used his engineering knowledge to design a car whose performance could be predicted in advance and his calculations proved uncannily accurate. Although the body is a conventional design for a touring car of the period every tiny detail was designed by Mr. S-L who engaged Salmons of Newport Pagnell to build and fit the body. The records show they completed this within three weeks at a cost of £60.00. The car was christened “Silver Stream” and this is embossed on its radiator. The reasons for this name are not clear and have been the subject of speculation. Some believe it was his intention to highlight the similarities to the Silver Ghost but the general consensus is that it is a reference to a stream near his home in County Kildare. It must be assumed that the overall cost of this car had made the prospect of building others unviable as this was never done although it was quite certainly his intention when he embarked on the project. 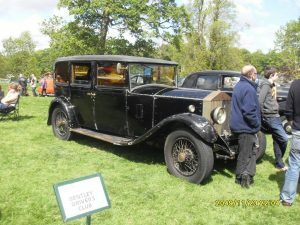 Mr. S-L used the car until his death in 1929 after which it was carefully preserved by his family until 1972 when it was purchased by Denis Lucey the vet I mentioned earlier. It was an important part of his collection and attracted sufficient interest to be featured on both an Irish banknote and postage stamp. The story goes that this was done without any reference to Mr. Lucey and that he had considered suing them for using it without his permission. I cannot vouch for this story or say if such an action was ever taken. Mr. Lucey died a few years ago and his family continued with the museum until it had to close as a local hotel who owned the land it was on wanted it to extend their premises. It might be speculated that Killarney had more need of a quality museum than more hotel rooms but that’s life. The entire collection was auctioned by Bonham’s at Hendon in April 2007. There was over 700 lots which included other magnificent cars, early bicycles and automobile and everything sold at well in excess of its estimate. 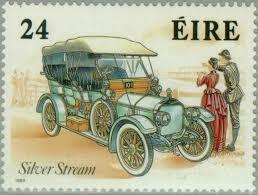 Silver Stream fetched £113,000 before buyer’s premium etc. I am always saddened when important collections are sold as it is likely that some items will leave the country. However, Silver Stream was purchased by a private Irish collector so at least she is back in Ireland where she rightly belongs. We all enjoy our cars in our own way and I would not presume to suggest that one way was more correct than another. I have always admired the dedication required to create a concourse, show winning example from a dilapidated barn find but if I owned such a car I would be afraid to use it, which defeats the purpose. I keep my own cars presentable but am pragmatic about losing originality to make the car safer on modern roads, flashing indicators being the most obvious. However, another category is beginning to emerge and I confess to finding it attractive. I am speaking of “Oily Rag” restorations where a car is restored to roadworthy condition but left as found bodily. A couple of years ago I spotted this 20/25 RR at Thirlestane Castle. It had been found in an outhouse of a country hotel in Aberdeenshire. It had been used to transport guests until the early ‘60s when it had been retired to the stables. Strictly speaking it was not a “barn find” as it had never been lost and everyone knew it was there. The new owner has restored it mechanically down to the automatic chassis lubrication but has left the body untouched and has no plans to change it. I found it very attractive and much more interesting than the shinier sisters she was parked beside. Every imperfection bore witness to some incident in her history and she just oozed originality. I would welcome comments for the next bulletin.